There is an interesting discussion going on since mid-October about the opportunity of a new school in between the commons on the website NappyValleyNet. Some people suggest supporting existing schools already in place and stopping huge amount of pupils travelling from other borough into them, and that support should go on local school rather than avoiding them due to some pre conceived ideas about the kind of children who attend. 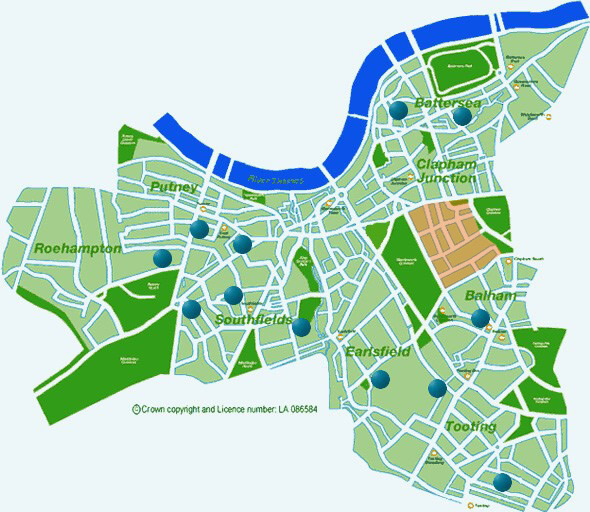 Others highlight that there is no secondary school in the all area of Clapham Junction and Northcote Road, that Wandsworth closed so many schools in the past and that taxes should provide good local state secondaries in every neighbourhood. However it seems that the Council is now fully engaged and being openly supportive and bringing in the involvement of relevant shadow cabinet members. “I want to keep you up to date with developments on the ‘free school’ plan which is being promoted by the Conservatives’ Shadow Children’s Secretary Michael Gove. Michael Gove’s team met with my colleagues to discuss the growing interest from parents in parts of Wandsworth and Battersea in setting up their own self-run schools within the state sector. This was attended by Executive Member for Children and Young People Cllr Kathy Tracey, Chairman of Children and Young People’s Services Overview and Scrutiny Committee Cllr Peter Dawson and Jane Ellison, Conservative Parliamentary Candidate for Battersea. Just because schools are in the state sector, they don’t have to be state-run. Currently the major obstacle to progress is the way central government controls schools’ funding. With a more radical approach we could free up the system so that it positively encourages local alternatives – whether these are led by parents’ groups or private companies. I’m also keen that other parents groups around the borough should be aware of the opportunities. 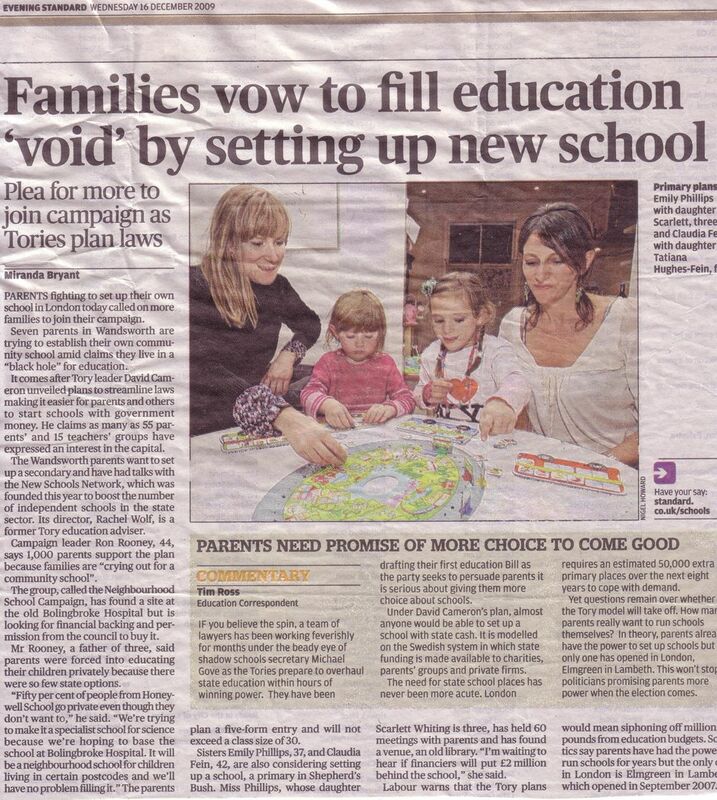 Anyone interested in setting up new schools can get in touch direct with the New Schools Network, a charity that offers free support to groups looking to establish non-selective state schools. Read also our article HERE. No secondary school in Clapham Junction area. Join the campaign! 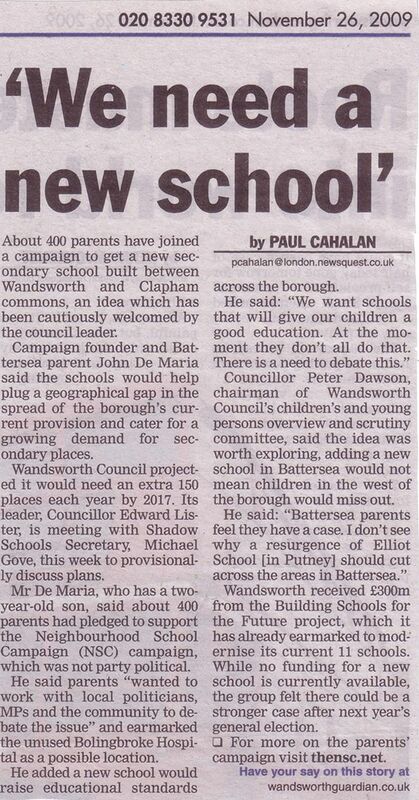 As a local parent here in Wandsworth, I’m part of a group of concerned mums and dads that’s campaigning for a new state secondary school for the Northcote Road area. We think everyone will benefit – our children of course, and the community we all call home. We’d really like to know what you think? And if you’re on side, we could really do with your help. If you can visit our website, sign the online petition, and forward this email to friends, family, colleagues – anyone who might help us gather the support we need to get this campaign rolling. And on behalf of the Neighbourhood School Campaign, thank you.